Here's an event with extra high prizes for Land ares below. 4. You claim your prize from Toni Chiee Lahderinne. 6. We reserve the right to adjust rules or cancel the event at any time without prior notice. Any points won before adjustments will be honored. You go hunt on our Land areas. Example to LA24 - Mesa Verde (31700 , 40000) Ambulimax. 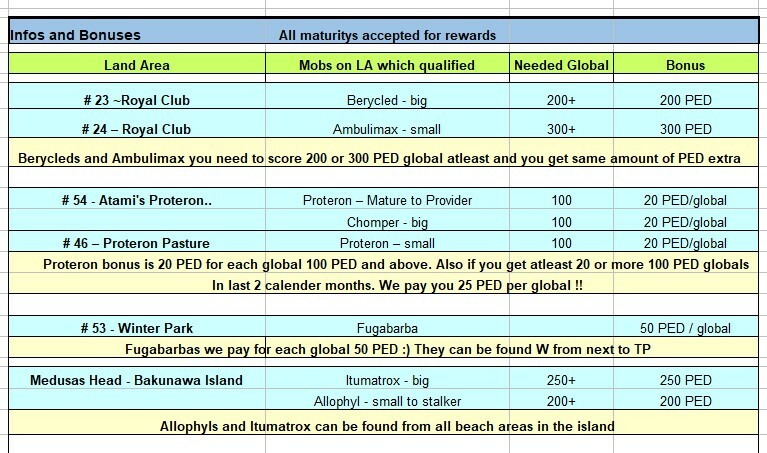 Each time you get +300 ped global / hof that means 300ped extra cash for you! Last edited by Chiee; 04-13-2019 at 06:55. ToMegaTherion ------------------------------ Leader : Diabolito ? Last edited by Chiee; 04-15-2019 at 14:46. I think I may do a run or two.